August 31, 2006 | As I wait in Greyline's 14-passenger Freightliner for the passengers to finish their float plane tour, I stare out the window at the cars, tourists and workers as they pass by. Cruise ship passengers are easy to spot by their attire, walk and hair, blending into a bland sameness. They are usually older wearing white, tans and light blues, with white hair, and their eyes hold a vacant look as they wander from one place to another. The workers are also easily recognizable because of the hurried way they move about, and mainly because I know most of them or have seen them before. (There are only 14,000 people on the island squished into a 32-mile-long by half-mile-wide expanse.) Everyone bends over backwards (for the most part) for ungrateful, oblivious, ignorant "beaters." Beater is what we in the tourism industry and the locals affectionately call the cruise ship passengers. The term 'beater' comes from the ski bums that spend their summers in Ketchikan working as kayak or climbing guides. A 'beater' on the mountain is some rich tourist that has come to stay for a week at the beautiful lodge and have a wonderful stay in Utah or Colorado. Consequently, this wonderful stay includes "beating" the mountain or tearing up the snow as much as they possibly can so the local crowd can curse them and shake their fists. 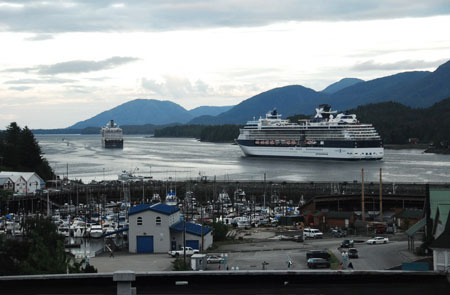 The beaters that come to Ketchikan, Alaska, on a cruise are a little different. They don't ruin the snow, but they do try their best to make our jobs as miserable as possible. Beaters are probably all wonderful husbands, wives, friends, employees, or whatever they are in regular life, but a bizarre thing seems to happen to each and everyone of them the second they set foot on to the cruise ship. They all, as one man put it, "seem to shut off their brains." This, my friends, could not be a more accurate description of the strange phenomenon that takes place when a wonderful human becomes a "beater." As you know, my job is to drive to the dock, pick up these beaters and take them to whatever super-amazing excursion they've spent way too much money on. So I load up my Freightliner, powered by Mercedes, ask them all to please wear their seat belts (which none of them would've thought to put on by themselves) and tell them my name is Ginger and if they have any questions to please feel free to ask. I like to point out various things of interest like the mill that milled the spruce for Howard Hugh's Spruce Goose and oldest church in Ketchikan, all the while waiting for the questions to begin. I pretty much know which questions will get asked and in what order they will ask them. Q: What is the population? A: 14,000, give or take 1,000 in the summers/winters. A: Folks, you are actually in a temperate rainforest at the moment. This means the weather stays pretty much the same year-round. The winter doesn't usually get much colder than 40 degrees and not really very much snow. There is, however, about 13 and a half feet of rainfall every year. Yes, that's right, I said feet. In 2005 Ketchikan had over 190 inches. A: Well, (I say as I dramatically look to the ocean) it looks like we might be at about ten feet. Q: Are there any main roads into Ketchikan? Driving the streets of Ketchikan is a challenge for this driver as the beaters wander aimlessly and without regard to local traffic, signs and regulations, much the same way they would on a vacation to Disneyland.